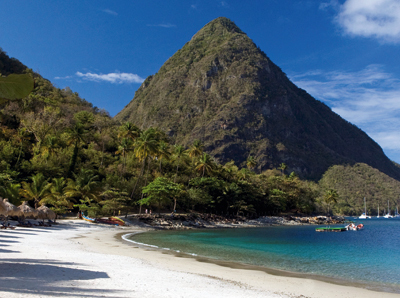 Right on the beach between the Pitons – St Lucia’s iconic, densely forested volcanic cones and World Heritage Site – work is under way to relaunch the Jalousie Plantation hotel as The Tides Sugar Beach. This perfect crescent of sand first caught the eye of Colin Tennant, Lord Glenconner, when he moved to the island from Mustique in the early 1980s. And so the Jalousie Plantation was born, with rooms based in cottages in clusters around the resort, managed by butlers employed from the local community. The hotel has since had a variety of owners with mixed fortunes. ‘Essentially, it’s turned from Perrier water to soda water to tap water, but the best chance for it to succeed is now,’ says Lord Glenconner. He’s referring to the fact that the 192-acre Jalousie estate where 24 varieties of mangoes grow is now in the hands of Robert Myers, founder of the Café Rouge restaurants. Mr Myers was tempted out of retirement when the estate came up for sale seven years ago, and he’s hired the Los Angeles-based Kor Group to manage the hotel, appointed the much-admired architect Lane Pettigrew to update the cottages and design new villas for sale, and asked Lord Glenconner to take out his formidable black book. ‘Roger Myers’ ambition is to create the best hotel in the world on the best site in the world it’s going to be chic by the shore,’ explains Naomi Cambridge, who’s in charge of villa and cottage sales on site. There are three levels of investment: one- and two-bedroom cottages, with their own plunge pools, sold, on a buy-to-let basis, from $700,000; larger, four- to five-bedroom villas, which can be leased back into the hotel when not in use by owners, from $2.8 million; and, finally, seven completely private, five- to six-bedroom villas on Glenconner Beach, which start at $7 million. In terms of popularity among British buyers in the current climate, St Lucia lies some way behind the favourite, Barbados, where, in the past few weeks, Knight Frank have sold a clutch of properties out of season. However, St Lucia is considerably better value property prices are estimated to be between 30% and 40% cheaper. And sales at Sugar Beach are outperforming all the other developments on the island (some of which have ground to a halt or not even got off the ground): 39 buy-to-let villas have sold or are in the process of selling, two Ocean Residence villas have been reserved, and there’s ‘serious interest’ in three of the Glenconner Beach properties.